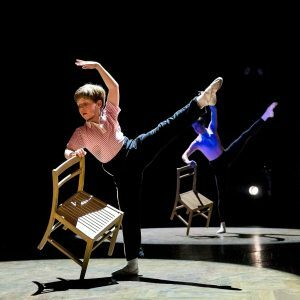 We sat down with Andrea Miller to find out what life on tour is like as well as how she took on the challenge of becoming Billy’s Grandma and what she thinks it takes to be ‘Billy Elliot’. My agent sent me for an audition and in the initial audition you just get the last part of Grandma’s song to learn. Then I was asked back for four recalls, which spanned for what seemed longer than a school term and then they offered me the job. Grandma is a typical grandma of the time, she married very young, which is what you did then. She had children; Billy’s dad is the only surviving one and she lives with Billy and his dad and elder brother. What is her relationship with Billy and why is it so important? Grandma’s relationship with Billy is so important because she provides stability – he’s lost his mum, his dad is stressed and doesn’t know how to deal with Billy. Billy’s troubled, he’s a lost boy and he gravitates toward Grandma. Grandma provides a haven for him. How does Grandma fit into the community? Grandma’s name is Edna – and everybody loves Edna – she tells it like it is. The miners all love her and all flock to her for breakfast and eat her out of house and home! But she’s got a heart, a real soul and she’s very much loved by everybody. What is Billy Elliot the Musical about? It’s a feel-good musical; it’s inspiring, it’s awesome. If you come to Billy Elliot the Musical you will not be disappointed because it’s a show for everyone. Everybody, at some point in their life, must have said ‘I can’t do that, I’m too scared.’ The musical shows you that you just need the courage to recognise the opportunity and to go for it, and Billy does that. Do you see yourself in Grandma at all? Yes, there are elements of Grandma in me – I have nieces and nephews so I know what it’s like to be around young children. In fact, I often like young children better than grownups because they’re more interesting a lot of the time and they’re interested in you as well, because as you get older you have more stories to tell. What dancing do you have to do in the show? I have a dance with six men, all representing my husband. That was what Grandma loved best in her life – the moments that she got to go dancing with her husband. It was a release for her, they were free from the people they had to be. The dance is to a waltz type song where she reflects on her life and if she had her time over again what she might have done. What do you find interesting with the choreography? In that dance it’s perfect for explaining a lot about Grandma. It’s simple, it’s effective and it’s explanatory. The other pieces are choreographed and integrated so well with whatever the current scene is. There are so many different factions and you just watch in utter amazement because they seamlessly fold into each other. It all fits in and it’s like a machine, it’s like the sets on a stage that piece together like a puzzle. What’s your favourite scene or musical number? My favourite number is Solidarity, I’ve got to say. I love all the numbers, I think they are wonderful, but Solidarity for me has got to be the stand out number of the show because of the different things that are going on. It’s an extraordinary feat of theatre, I think its gobsmacking, really. What do you think it takes to be Billy Elliot? It takes steely determination. You can’t have any fear of doing these acrobatics, they’re not frightened of doing the twists and the backflips. You have to be an actor, a singer, be able to dance and do acrobatics. It’s not asking very much really, is it? No pressure. But, I’m sure there are people listening to this saying, ‘I want to try, I really do…’, and you know what never, ever give up. There’ll be bad times and hard times when you think, ‘I simply can’t go on’, but you never know what’s around the corner. What have your biggest challenges been with this show? The biggest challenge for me has been the dancing. I went to drama school, which was many years ago, we didn’t really get much dancing. I love dancing, I’m a very good dancer but it’s not something that I’ve used over the years. So the minute someone says ‘You’re going to have to dance in this’ I think, ‘Oh, I’m not doing it!’ The boys helped me a lot, they were very sweet, they’d say ‘Keep your feet beneath you’; so they helped me and still do. What’s it like working with the Billy’s? I have four Billy’s, each different from the other, each hugely talented in their own way, and they’re all darling boys. They act wonderfully well, they’re helpful, and they laugh at me and my jokes. 1. Everyone on stage has a tutu apart from tall boy, that’s 31 tutus in total. 2. Billy changes an item of clothing every time he exits the stage. 3. The men have 3 pairs of miner boots each, one pair has built in taps and one pair are steel toe capped so they can move the pit gates safely. 4. 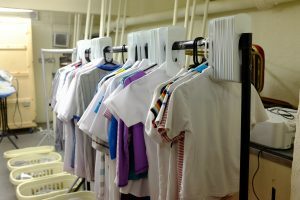 The wardrobe team spend roughly 4 hours in the afternoon and 3 hours during the show doing laundry to get it all washed and ironed. 5. Billy’s fastest change in the show is the change from Grandma’s Song to Solidarity. 6. All the tap shoes are grip taped across the front and back taps to prevent slipping; this is replaced constantly throughout the show. 7. The wardrobe team spend 5 hours a day on maintenance to repair all the costumes from the previous show. 8. 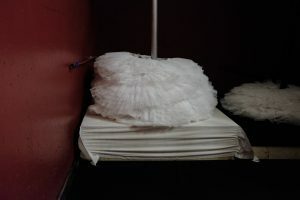 The change into Riot is done behind the barricades, costumes are hung on the barricades ready for the cast to grab. 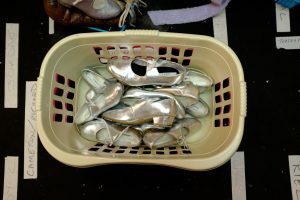 Two of the wardrobe team have to run on stage and help to clear the costumes before they end up making a stage debut! 9. 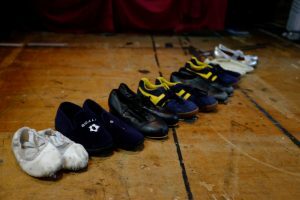 In each show, the performing Billy will wear seven pairs of shoes – one pair of trainers, three pairs of tap shoes, one pair of ballet slippers, one pair of bedroom slippers and one pair of tap covers. 10. Each boy grows out of his shoes at least once, often twice, during his time with Billy Elliot the Musical. Like many speciality shoes, it takes a while to break in, so they try to hang on to them as long as possible. Book your tickets for Billy Elliot on tour. 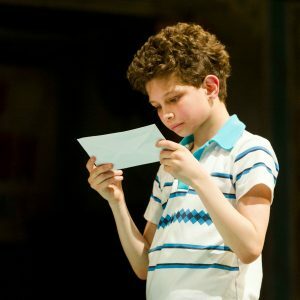 We caught up with Scott Garnham who plays Billy Elliot’s on-stage brother, Tony to discuss his dancing challenges, favourite moments in the show and the importance of the brotherly relationship. He’s Billy’s older brother. Unfortunately their mum passed away, the way we play it, three years ago. He’s a Union man, he’s been brought up that way because of his dad. He’s a staunch supporter of the miner’s strike. Why do you think Tony’s relationship with Billy is so important? At the start of the show Billy is, not a wild child, but he’s lost his way a bit, and I think that has a lot to do with the fact that they’ve lost their mother. Tony thinks that their dad isn’t coping and becomes this disciplinarian of the family. Billy has this great opportunity to get away and there’s probably an element of jealousy in that from Tony. Overall, what is the show about? Billy Elliot is about this guy called Tony. Okay, no it’s not! It’s a story about overcoming adversity, but I think there are two stories that we’re trying to tell. The first one is about this young boy who discovers he has a natural gift for dancing and his journey to live his dream and get away from the town he lives in. The other which I think my character, Tony, is much more involved, is about trying to succeed with the miner strike. I think it’s important that we tell that story equally as much as Billy’s story of hope and ambition. Do you see yourself in Tony at all? There are parts of Tony that I do see in myself – he’s quite headstrong and maybe has a short fuse at times, which I can definitely relate to. Above anything else, he’s passionate, and I’d like to think that I am too. I’m passionate about the art we do every day and the stories we get to tell and I’m lucky enough to do that. There’s another side of him that I don’t see myself in – he’s a wild canon, and quite violent and I’ve never been in a fight in my life. Tony would beat me in a fight, I’ll put it that way! So what’s it like with all the fight scenes then, if you’ve never had a fight, how have you been getting on with those? I mean, I’d say they’ve been a challenge, but we have such great fight directors and creatives, and also I have a brother who’s three years older than me. So when I say I’ve never had a fight, I mean a proper fight. I’ve never physically thrown a punch to try to hurt somebody, I just don’t really understand that mentality. Can you tell me about the little bits of dancing that your character has to do? Dancing was a challenge, I’m not a trained dancer. The interesting thing about Billy Elliot The Musical is that the choreography is incredibly acting based– there’s intention behind what you’re doing and that makes it easier for an actor, but it can also make it a little bit harder because you don’t do what you’d call ‘generic steps’. At the end we do a little bit of tap, but I’m quite lucky it’s only a little bit. I wasn’t employed for my dance skills – I’ll put it that way! What do you think it is about the choreography of the show that makes it so unique and special? We’re trying to tell a story, we’re not just putting on dance routines to entertain. I remember thinking very early on that it was quite odd – Billy Elliot is the story about a boy who wants to dance and everyone’s against that, but then the whole town is singing and dancing. But then I realised what’s really happening is we see the world as Billy imagines it – everything is a movement, everything’s heightened in that sense. That’s what’s beautiful about the show, we have these heightened moments of choreography into really realistic, dramatic scenes. What’s your favourite scene or musical number in the show? My favourite scene in the show, selfishly, is what we call Pit Gates. It’s a moment in the show which we’ve actually changed and adapted for the tour version, it’s quite different to the version that was in London. There’s a great moment where the entire town turn their backs on Tony and people spit at him and it really helps my character because it makes the audience appreciate what he had to go through. My favourite song has to be Solidarity – I just think it’s so amazingly well put together – acting, dancing, music, the lot. 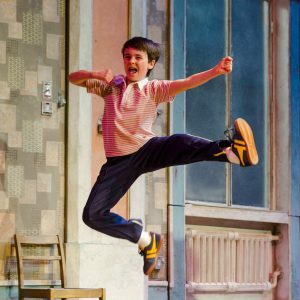 As a performer, what do you think it actually takes to be Billy Elliot? I’m always amazed at how they can find young boys who can do everything required to play Billy Elliot. It’s unbelievable when you watch them, not only are they very intuitive, smart, reactive little actors, but they’ve got these great singing voices. And to say that they ‘dance’ just doesn’t do it justice – they tap like you’ve never seen anyone tap before, they’re back flipping off pianos, we fly them around the stage and the ballet is incredible! We have, quite literally, four of the best young performers in the world. What’s it like working with the four Billy’s? It’s great – they’ve all got such different personalities and they all bring something very different to the role and the creatives encourage that – they don’t want carbon copies. Some have got some vulnerability, some have got a bit of an edge, some know that they’re good, not arrogantly, but confidently, and that brings a new lease to that leading man element – because they are the leading man ultimately. What have your biggest challenges been with the show? I think my biggest challenges in the show is the dancing, which is getting there I’m told – I was told very early on that I was one of the best ‘dancing Tony’s’ they’ve ever had, which is funny. The accent was hard, it’s quite a specific accent, but we had a great dialect coach. What do you think the challenges of going on tour are? Touring is always hard – I’m engaged and I don’t get to spend every night at home in my flat with my beautiful fiancée, which is a shame. But what I like about touring is that I find the audiences really, really appreciative of good theatre. The fact that this is the first time we’re taking it to different regions is really exciting and I hope that the audiences will be really up for it and really enjoy it. 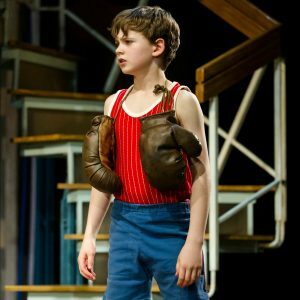 Martin Walsh, who plays Billy’s dad in Billy Elliot the Musical, talks us through who his character is, the importance of his relationship with Billy and how he sees himself in his character. I first got a phone call off my agent and they suggested that I go along and audition for the part of dad. I said I’d love to! Within the community I think he’s one of the leaders within the working environment at the pit, probably one of the foremen. He’s also a father of 2, he’s now a widow, Tony is already grown up so there’s less or different problems with Tony, he’s grown into a man. Billy’s the younger one, he’s his mother’s love. Dad’s really struggling with the balance of work life, especially back in the 80’s which was worse than it is today, to be both roles. Why is Billy’s relationship with his dad so important for the story? Dad’s relationship with Billy in the play is really important, I think it’s intrinsic in the fact that Billy’s forever looking to him and at least for the first half of the play he’s somewhat missing, he’s somewhat absent, if not in body in mind and in time that he gives to Billy. Billy’s a bit of a lost soul and dad’s struggling. He feels all the right emotions I think but he can’t get them out and he can’t show them to his son. Hopefully we get there in the end! What in your eyes is Billy Elliot all about? Well, it’s not just about Billy Elliot, obviously that’s the main character and it is about a little boy’s struggles growing up. Going against the grain in what I think is quite a loving supportive community, but one that’s struggling through emotional times and struggling through losing their jobs and their communities being ended really by their main employee going away. But it’s also about community, it’s about family, it’s about love, it’s about expressing that love and showing that love. For me it’s about a father who’s struggling both with the loss of his wife, one son who’s turning into a man and one son who’s trying to find himself. Do you see yourself in Dad? Yeh of course, I mean I am a dad I’ve got 2 little ones at home, a 5 ½ and a 1 ½, so that’s tough! Every time I look at Billy, although the age is different I still see a vulnerable child and emote to that. It brings up lots of emotions for me so yeh I do see myself a lot in dad, being a dad I suppose helps. And that struggle with coming from a similar background, a mining community, I’ve got a similar working class background and wanted to do acting as a career. There wasn’t the same struggle, there wasn’t the same stigma attached to it but it was a bit of a joke thing, a “you’ll grow out of it” sort of thing. It wasn’t laughed at but it was like, “You’ll get over it”. Do you have to do any dancing in the show? We do a little yes, we won’t torture the audience with it! I’m not there for my dancing skills but yes we have fun, everybody’s dead supportive. Some of the guys and gals are just cracking dancers, they’re really good and they’re always there to help and they’ll always pitch in and show you a step again. It’s not too advanced, it’s certainly nowhere near the scale of what some of these guys are doing! What do you think it is about the Choreography that makes Billy Elliot special as a show? I’ve never seen Choreography like it, it’s balletic obviously but it’s also athletic and gymnastic, it’s tap. It’s all these things that I’ve really seen from afar, I’ve never been that up close to and I get to share the stage quite a lot with the Billys when they’re doing it, and it’s both fascinating and inspiring, it’s beautiful. What was the training and rehearsal process like for the show? I’d say primarily my function is to be there to act, there’s lots of singing and we touched on a little bit of dancing. It’s just having the discipline really, being in the same room as some of these guys who put their legs in positions I could never dream of and bend their backs almost in half which is not going to happen in my mid 40’s! The training we do, it’s all about feeling together as a group, obviously there’s warm up to make sure we’re vocally ready and physically ready but there’s such an array of vocal use and physical use of our bodies that people need different warm up techniques, so if everybody’s bending and stretching then I’m certainly not doing that too much! They’d probably have to put me in hospital! My favourite scene in the show is Electricity; sharing the stage with the Billys at that time and watching them do their thing, up close and personal, they’re right in front of me doing it, putting myself in the situation of being the father, it’s hopefully a beautiful moment. I certainly enjoy it! All the Billys are different, they all bring something different. I thought I’d have a favourite or something like that but it’s not true, each and every one of them has different nuances both in the movement and in the acting and it’s just great! I think you just need skill, I think you need to be fearless and I think you just need to love it. What have your biggest challenges in the show been so far? There’s physical challenges and vocal challenges but that’s part of being an actor. I think the biggest challenges have been, although very enjoyable, getting to know the Billys; getting to know my “sons” also getting to know the Tony character, who’s also my son but I’m very much protective towards the smaller guys having left my family behind for the tour. So although I’m deeming it a challenge it’s been a very enjoyable one. What’s it like working with the Billys? It’s great working with the Billys, it reminds me of when I was small. Although I wasn’t dancing, I was doing youth theatre and musicals. I see the joy and the fearlessness in their faces that I remember having. From my youth I never remember the struggles of rehearsals or learning lines or the pressures of “what happens if I forget it”, I just remember the joy. To see these 4 little fellas doing their thing fearlessly and just going full at it, it’s a joy, a pleasure. What are the other kids like to work with? The other kids in general, they’re just so switched on, so there all the time. You’d expect their concentration to wander but really it doesn’t. They’re so good, in some ways you’d argue they’re more professional than we are. Every rehearsal they’re there in the moment and giving it everything they’ve got. It’s great to watch! And last but not least, Matthew Lyons, one of our four Billys shares his favourite things. Next up in our “Meet the Billys” series, it’s Lewis Smallman! We caught up with Annette McLaughlin who plays Mrs Wilkinson to find out how she connects with her character, Billy’s dance teacher, her challenges learning to skip and tap at the same time and what she thinks it takes to play Billy Elliot. Mrs Wilkinson is the dance teacher in the miner’s welfare in Easington, it’s a class full of girls who haven’t got a huge amount of talent and then one day this young boy, Billy Elliot walks into her class accidentally. She sees potential in him and she sees that he has a huge amount of talent and a passion for dance. I think he ignites something in her and she sort of becomes his mentor and a mother figure to him. Why is her relationship with Billy so important? I think because she believes in him and encourages him to follow his dreams and I think he opens up to her about his feelings. They sort of have a trust with each other, I don’t think he’s really been able to do that before. How does Mrs Wilkinson fit into the community itself? She’s kind of separate from the community, there’s a difference of class. She butts heads a little bit with Billy’s dad and with his brother. She’s separate but I think she does understand what’s going on. I think she’s looked at differently because she’s not the same as everybody else. She sees the focus in helping this boy achieve his dreams and potential. Do you see yourself in Mrs Wilkinson at all? I probably do, I desperately wanted to be a ballerina from age 3 and went to the Royal Ballet School as a junior. I’ve always had a passion for dance, and for whatever reason Mrs Wilkinson I think probably had those dreams as well and somewhere along the way something else got in the way, and she couldn’t quite fulfil those dreams. So I completely get all of that and the passion for dance. Then seeing this young boy and… I feel it myself I don’t have to act because when I see those brilliant talented boys being extraordinary on the stage; the first time I saw them do Electricity in the rehearsal room, I was an absolute mess because they were wonderful, and it’s that passion of dance and passion of what you love I think I really associate with her and with their journey together. What sort of dancing do you have to do in the show? I remember saying to our associate choreographer “she doesn’t dance does she? She just sort of stands and smokes doesn’t she?” This was before I started rehearsals when I got the job and she said “no, she does a massive dance number”. I’ve realised that now! It’s not just standing and smoking! There’s a massive number called “Born to Boogie” which is brilliant with Billy and Mr Braithwaite. There’s an awful lot of dancing in that, tapping and skipping probably being the trickiest and took me ages to learn. I nearly threw my skipping rope at the mirror 25 times! What is it about the Choreography of the show that makes it so interesting? I’m a massive fan of Peter Darling (Choreographer), I have been for years the man is a proper genius! Everything means something, every single step on the stage means something. I think one of the most extraordinary pieces in the show and of any musical is “Grandma’s song” and how that is choreographed. “Born to Boogie” as well, all the steps have a name and they all come from an acting point of view. Stuff that we do earlier on in the show then links up to “Electricity” that Billy does with things he’s already learnt, and Dream Ballet are things that she [Mrs Wilkinson] has taught him and you’ve seen us do in “Born to Boogie”. The choreography all comes from a ballet point of view but slightly twisted in places. I don’t know, I’ve been trying for years and they won’t have me! It takes somebody really extraordinary, these kids are amazing, and I don’t say that lightly either. They are brilliant actors, brilliant dancers, brilliant singers. They’re professional, polite, funny, I don’t know how they find them! I do have to say as well the training that these kids get, they’re never treated like children, and they’re never talked down to. They’re respected and treated like actors. It’s been really inspiring watching the acting department and dance department work with them and watching them grow. They get the most amazing training in this show, they learn to be these wonderful performers not by being a robot, by really understanding why they’re saying things and what intention is in acting. That’s something really inspiring to watch. What’s it like working with the Ballet Girls? I’ve been working with 3 sets of Ballet Girls and 3 Debbie’s, who is Mrs Wilkinson’s daughter. The Debbie’s are hilarious, brilliant and so, so good! They’re so inspiring the kids, again they’ve been taught brilliantly by the creative team. Most of them have never been on stage, never worn a microphone, it’s all new and exciting to them. They’re brilliant, they get on with it and are professional. It’s been delightful!